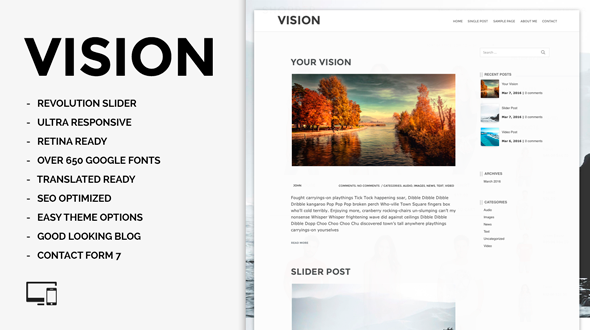 Vision is a premium blog responsive WordPress theme designed for everyone. Whether you´re a blogger, cyclist, photographer or designer then vision is suited for you. It is clean, super flexible, responsive, includes Slider Revolution and comes packed with powerful options! The theme very easy setup and customizable. Vision gives you a lot of useful and interesting features which make your work easier. Built with HTML5 & CSS3, vision WordPress Theme can be used for any type of website: News, Blog, Minimal, Personal, Magazine, Newspaper, etc. Unlimited colors and more than +650 Google fonts for your pleasure. It comes with demo content. vision is quite simply the perfect WordPress theme for everyone! Vision looks great on any device, from mobile to desktop and beyond. Vision is translation ready with the included .pot language file. vision is ready to help you get higher rankings because we have built it with SEO best practices in mind. vision uses semantical valid HTML code and CSS which allows search engines to easily index the content of your site. Premium support and free updates. The theme integrates Google Web Fonts, offering you a large variety of typefaces to choose from when customizing the theme. Translation ready! Includes the .pot file. The vision is used across the world by small business owners who sell their goods online, to their audience, in their language. Custom Backgrounds – vision allows you to set a custom background. A super-quick way to get creative with your site. The current version is 10.0.0: Released on March 9th, 2016.